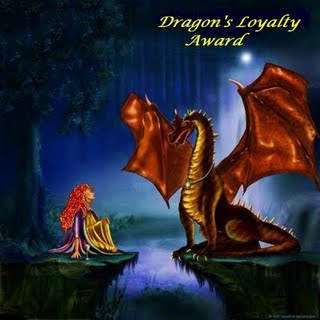 I have received the Dragon´s Loyalty Award and I feel really honored that somebody felt that my blog is worth getting this award. Rafe the Necromancer – An awesome blog written from the point of view of a demon child. Written by Daphne Tuccitto, writer of novels for young adults in the fantasy fiction genre. Film the Madman – Interesting reviews of movies beyond the mainstream. Fraking Films – From Hollywood to independent cinema, you want it – they have it. Marie Gilbert – The super heroine in the body of a grandmother. Oh, and she has written a postapocalyptic novel, too. Robbins Realm Blog – Here you´ll find a ton of reviews of interesting (and also older) movies you might have missed. Portland’s renegade film critic – Wanna read film reviews? Here you go. Paul Militaru – The awesome photographer. Mimulux – An artist from Europe who creates images beyond the mainstream. The new guy – Looking for a movie review from sci-fi to action to everything that is fun? Here you go. Daniel Lackey – Movie reviews: Excursions into uncomfortable cinema. Once there was a nest of Knautbolds near my apartment. I found the hidden entry to their hiding-place and made some sketches – without having any bad intentions. The next day, when I wanted so look after them their habitat was abandoned. As a kid I loved to sneak into a cable factory with one of my friends from the kindergarten and crawl onto the gigantic cable reels – we were about six years old. The same friend from the kindergarten on one day shared a lot of sweets with me. It turned out that he had sneaked into our kindergarten at night (remember: we were six) and had taken the sweets from there. Untill now I do not know how he got into the kindergarten. When I was at the university I worked out a lot and I wore Levi’s jeans – a lot. That’s why one of the female professors called me the “Levi’s man”. I always have sketchbook with me. And when I have to wait for a train, a metro or for somebody at a café the chances are big that I´ll be writing down some story ideas and doing some scribbles of postapocalyptic fairy tale mutants. One day some friends came to visit us. They had a little boy – he was maybe 1 1/2 years old. He kept saying and making socalled baby-signs that there were “little black men” below our parquet floor. The other adults said that he had seen some ants. But the truth is: I have never, ever seen a single ant in my apartment. What he has seen must have been indeed little black men. Muy contento por tu premio y muy interesante tus post!! help john… how do i inform the bloggers that i awarded them? Thank you very much for the nomination. I greatly appreciate it. Congratulations! Well deserved, your blog is wonderful – and thank you for nominating me. It’s an honor to be named among such creative and interesting blogs! Thanks so much for the nomination, you are so kind!!!! Thanks John 🙂 🙂 stay brilliant! !